We have many pictures of unique nursery painting ideas that will help you to create the perfect background for any crib bedding set and décor that you choose. The wall painting techniques will adapt to most any paint color making it easy to design a room using any combinations that parents find visually pleasing. Visitors to our site have shared beautifully executed wall murals that attest to their artistic abilities as well as those that a beginner will find easy to duplicate using stencils. You will also see painted stripes used in a variety of ways to visually camouflage the size and shape of rooms that might otherwise seem too small. 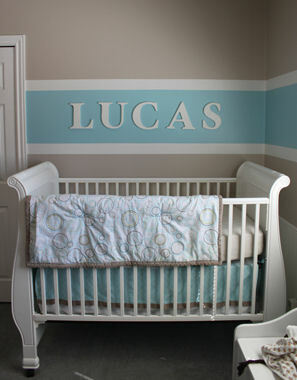 Go here to see stencils, brushes and other supplies that will make your nursery wall painting ideas easy to manage. We have ideas for painting a baby girl nursery room in pink (as well as many other colors) as this mom chose using a stenciling technique to give the room some extra pizazz. 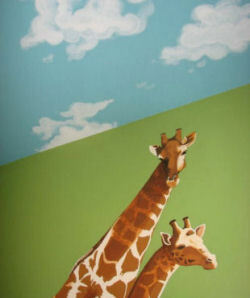 Stencils and stickers are a quick, easy and inexpensive way to enhance the walls in a child's room. 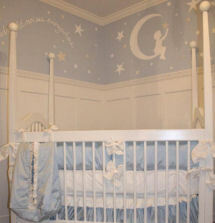 A boy nursery wall painted with a mural featuring the moon and stars in baby blue and white creates a peaceful atmosphere. 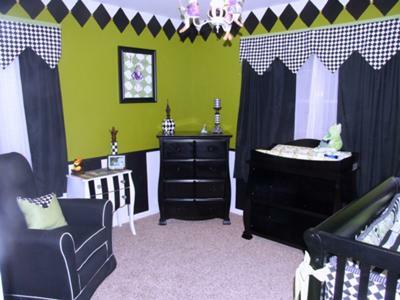 Whether you prefer to paint the nursery in vertical or horizontal stripes we have examples of rooms painted using unique and attractive paint schemes. These pictures will help you to find the best color for your baby's room. After you've made your choice and mastered the basic techniques, then you can advance and learn to paint wall murals and sample other techniques if you choose. Cloud painting is one of the easiest painting techniques for a beginner. Shapes and patterns including circles, squares, diamonds and polka dots are well-suited for modern spaces. Moms and dads are finding that paint is an inexpensive way to create an argyle nursery accent wall in their baby's room. The pattern in this nursery is used as a ceiling height wall border but we have lots of pictures to inspire ideas. Techniques for painting a nursery for a baby girl may be identical to those that you used to paint the nursery for your baby boy. For example, painting stripes on the nursery walls is every bit as popular in a boy's room as it is a girls with the primary distinction being the choice of paint colors. You have the choice of painting even or uneven wall stripes and each will give you a chance to display not just one but two or more feminine colors carefully chosen from your inspiration piece. Bold colors are very trendy in boys' rooms right now. I see rustic browns and earth tones and bright primary colors challenging baby blue for the title of most popular. The patterns are fun and high contrasts make for an energetic space geared towards surrounding a rambunctious boy with everything from cars and trucks to traditional snips, snails and puppy dogs' tails. The exception being when mom and dad are devoted to creating a space of peace with a tranquil atmosphere. For this type of room a cloud painting technique on a light blue wall would be perfect. Painting nursery murals takes a lot of time but surprisingly, less artistic talent and ability than you might have imagined. With the use of overhead projectors, stencils and fast-drying (baby safe) wall paints painting a mural in a nursery is possible even for rank amateurs such as myself. 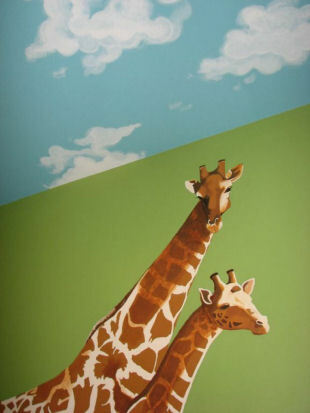 Is it EASY to paint a mural on the nursery walls? That probably depends on how large the walls are and the detail of the scenery or subject matter that you would like to paint. 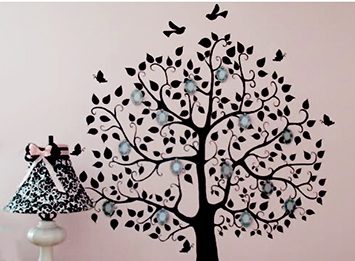 A simple tree mural would be easy for even a beginner to paint where a jungle nursery mural with many trees, wild animals and birds would be a challenge. Don’t get in a hurry; we will help you break the process down into a few easy steps. If you are a beginner, it's always good to master the basics before moving on to more advanced, challenging techniques. Tackle the project in an organized fashion and get a feel for the basics. Once you get your brush wet, you may find yourself overwhelmed with creative nursery painting ideas. Do you have a picture of a nursery that you painted using a unique painting technique? Tell us about it! Close your eyes and imagine your favorite decorative item that you will use in your baby’s nursery. Would the one accessory that in your opinion makes or breaks your dream nursery design a framed art print, the nursery bedding set or perhaps the upholstery on the nursery rocker cushions? Once you pick your item, congratulations are in order because you have just determined the color palette on which to build your nursery painting ideas. Now, isolate THREE COLORS from your inspiration piece: the lightest color, the darkest color and a neutral or medium shade. Don’t dally, just PICK! Where Should You Put the Lightest Color? Of these three colors, the lighter shade is probably the most important because you will use it as your main wall color. This color will serve as the background for any decorative nursery painting ideas like painted wall murals so you might have to play with it a little by adding a tiny bit of gray or white to knock the edge off so that it will blend with your color scheme. Where Should You Put the Color with the Medium Value? The medium shade will be used on upholstered furniture, the floor covering and nursery window treatments. Resist the temptation to go too dark at this stage of the game, refer to your inspiration print to avoid mistakes when experimenting with nursery painting ideas. Where Will the Darkest Color Go? Make plans to visit Unique Baby Gear Ideas again very soon to see the latest nursery wall painting ideas shared by real parents who found that painting a nursery can be lots of fun!